This paper defines spuds and mashups and places them in a wider technological context. Then, it provides examples that demonstrate the bold claim made in the title. If you’re like a lot of other technology managers and event organizers, you’re probably grappling with issues related to how best to promote your organization’s events online. While you undoubtedly have dozens of very specific requirements in mind, your ideal website calendar solution most likely includes these four high-level characteristics. Convenient. Are you tired of the labor-intensive website calendars you currently maintain? Frustrated at watching highly paid IT professionals inputting and updating events? The ideal solution will definitely be convenient to implement and easy to maintain. Flexible. The last thing you want to worry about is remembering to update the same information in more than one location. What you need is a website calendar solution that allows you to call your event data source from different pages on your site so you can present the same information in different ways to different audiences. Customizable. When you publish event information on your website, you don’t want it to look like it comes from some third party application. The ideal solution gives you control over the content and appearance of your events so that your online calendars reflect your organization’s brand. Engaging. At the end of the day, you want a website calendar solution to increase awareness of and attendance at your events. That’s a tough guarantee for any solution to give. It seems perfectly reasonable, however, to expect the ideal solution to engage site visitors by providing interactive calendars that make finding and remembering to attend events as easy as possible. Does this ideals list sound a little too ideal to be true? On the contrary. The ideal can be real today using a web-hosted online calendar solution that supports a spud-based delivery model. While you may not have heard the term “spud” before, you most likely have encountered one or more of the terms for the group of objects to which spuds belong. Spuds are members of the Widget group. Other names for Widget, according to Wikipedia, include gadget, badge, module, capsule, snippet, mini, and flake. If you’re familiar with widgets, you’re probably also aware that both Microsoft and Google sponsor websites where you can download a variety of widgets. A quick trip to one or both of these sites demonstrates that the Widgets group contains two subgroups: Desktop Widgets and Web Widgets. Because spuds are widgets that run on websites, we’re going to focus on the Web Widgets subgroup. Put another, slightly less geeky way, a Web Widget is a little program you can add to any web page, where it operates independently of the rest of the page. Because Web Widgets are programs, they are almost always dynamic and interactive. To move from the theoretical to the concrete, let’s look at an example: The Stock Chart Web Widget available at Google Gadgets for your Web Page. Let’s say you manage an online investment club focused on publicly-traded retail companies. You might want to add one or more Stock Chart widgets to the club website so that members always have, at their fingertips, the latest share price information for a few specific stocks. A Stock Chart widget you add to your site might look like the one above. Let’s consider a few of its characteristics. Its customizable. Before you add the widget to your web page, you customize it to look and behave the way you want. For example, you specify the ticker symbol for the stock you want to track, set the text for the title at the top of the widget, and choose the style for the widget’s border. We customized this widget by specifying the ticker symbol FCCN.L for French Connection, a company that markets a clothing line and trades on the London Stock Exchange. The title identifies the company, and we chose a wide blue border. The widget is interactive. Clicking the title at the top of the widget opens the United Kingdom financial news page on the Yahoo! website. You can copy this code and paste it into one of your web pages to add the Stock Chart described above to your own website. Spuds are Web Widgets that behave in specific ways. The term spud is a—somewhat facetious—play on the concept of “mashup.” A mashup is a web page that brings together content from more than one source. The IT world borrowed the term mashup from a hip-hop music practice of mixing two or more songs together to create a new song. Now let’s return to our original claim—that spuds and mashups are the best way to promote events online. In this section, we’ll validate that claim by looking at four spud examples that demonstrate the ideal characteristics we talked about in the beginning: convenience, flexibility, customizability, and engagement. Spud technology gives you the luxury of implementing and maintaining website calendars in a way that works best for your organization. Spuds allow you to present the same event information in different ways in multiple locations without updating the information in more than one place. You can customize spuds so they blend into your website and reflect your brand—same fonts, same colors, and same style of presentation. Your website visitors can interact with your calendar and other event spuds, thereby making the events easier to find and remember. 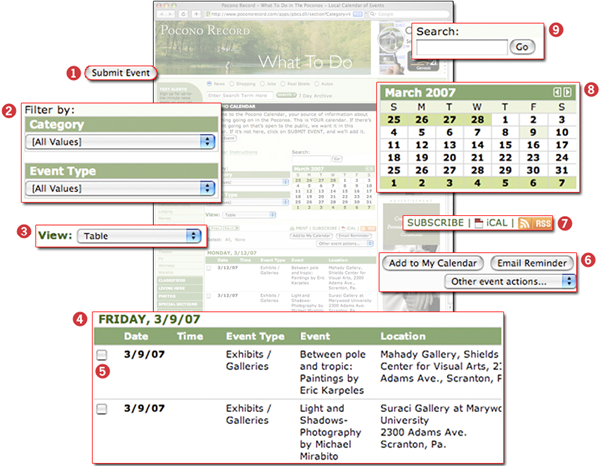 Note The organizations mentioned in the following examples subscribe to Trumba Connect, a web-hosted solution for publishing website calendars and other event spuds. As subscribers, the organizations store their event data in a Microsoft® SQL Server database maintained by Trumba Corporation, which is accessible via web server for the spuds to call. In a spud-based world, form is separate from content. This has enormous implications for the processes you use to implement and maintain event information on your website. With spuds, you can leave the form side of things—creating the spud, customizing it, and embedding it into a page on your site—to web developers. Once the spuds are implemented, however, developers are out of the picture. You can assign the content tasks—adding, deleting, and updating events—to the people closest to the event information. This puts you back in control of the event maintenance process. It also greatly increases the likelihood that event information on your website will be up to date. The Ogden, Utah Convention and Visitors Bureau (CVB) website demonstrates the value of separating form from content. The Event Calendar page on the Ogden CVB site contains a Calendar spud (2) that includes a calendar list (1). The Calendar spud and list work together. The category colors in the calendar list correspond to the event colors in the Calendar spud. 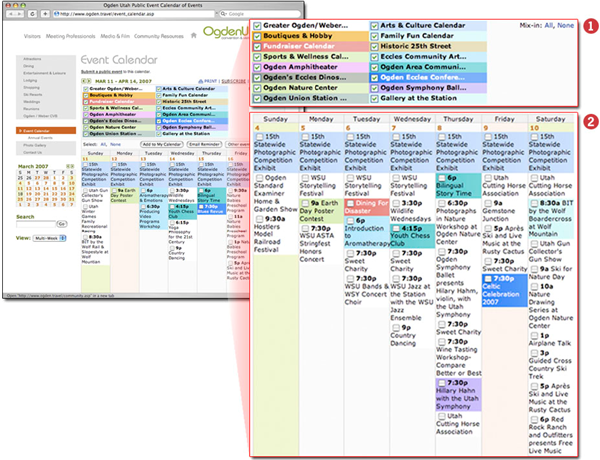 Calendar visitors can filter the events they see in the Calendar spud by selecting and deselecting categories in the calendar list. As the calendar list (1) indicates, Ogden CVB created a separate calendar for each category of events. While responsibility for creating the spuds and publishing them online is centralized with Ogden CVB, representatives of the agencies that sponsor events in each category maintain their own calendars themselves. This distributed arrangement eliminates inter-agency communication and workflow delays. Tourists and residents benefit by having ready access to the latest regional event information. The Ogden, Utah Convention and Visitors Bureau (CVB) provides a comprehensive events calendar on the Event Calendar page of its website. It also entices tourists and residents who land on its home page with the next couple of upcoming events. It accomplishes this by embedding an Upcoming Events spud into its home page. The following Upcoming Events spud references the same event data as the Calendar spud (shown in the previous section) so updates made to the event data source appear instantly in both spuds. In addition, the Upcoming Events spud is interactive. 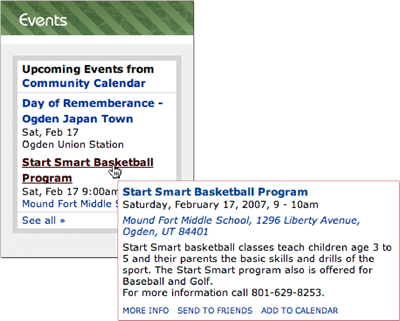 Site visitors can hover over an event to display an event details popup (as shown in the picture), click an event to open an event details page, and click the See all link to navigate to the full events calendar (the Calendar spud). You may remember that the Stock Chart widget had a number of parameters that you could customize before you copied and pasted the widget into a web page. For example, you could set the stock ticker symbol and the color and size of the border around the widget. Some aspects of spud behavior, such as how many events a spud lists, how the events are displayed, and whether or not an event details popup appears when a site visitor hovers over a description. The ability to customize spuds means that you can present event information as an integral part of your website brand. 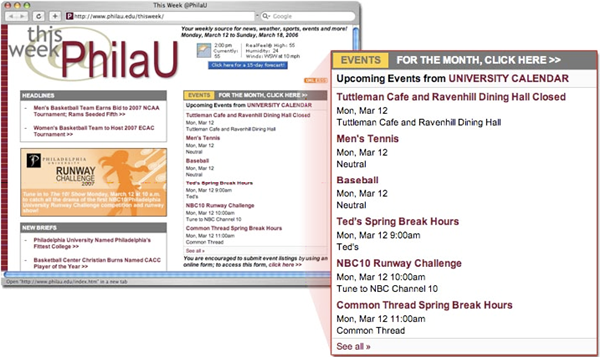 For example, Philadelphia University customized text colors and fonts in an Upcoming Events spud embedded into its website (shown below). The spud integrates fully into the site and reflects the University brand. In addition, the University set the spud to display six upcoming events with no hover popups. Because spuds are interactive, site visitors are more likely to find events they care about and remember to attend them. The What To Do page on the Pocono Record website demonstrates the power of interactive spuds. Click Submit Event (1) to submit events for inclusion in the Calendar spud (4) (editors review all submissions). Choose values from one or both filters in the Filter (2) spud to create a filtered list of Calendar (4) events. Choose a view in the View Chooser (3) spud to change the way the events in the Calendar (4) display. Select one or more events (5) in the Calendar (4) spud and then choose an event action (6) to add events to your personal calendar, set reminders, and more. Click one of the subscribe options (7) to receive ongoing notification of upcoming events through an iCal, RSS, or Atom feed. Click a date in the Date Finder (8) spud to display events in the Calendar (4) spud that occur on that date. Hover over a date to display a list of that date’s events. Type one or more keywords in the Search (9) spud and click Go to start a full text search of all of the events in the Calendar (4) spud. Web Widgets are dynamic, customizable, interactive programs you can add to any web page that operate independently from the rest of the page. As a specific type of event-related Web Widget, spuds offer you a convenient, flexible way to publish customizable calendars and other event information on your website. Because spuds are interactive, site visitors can easily find events they’re interested in, add events to their own personal calendars, and take other actions.